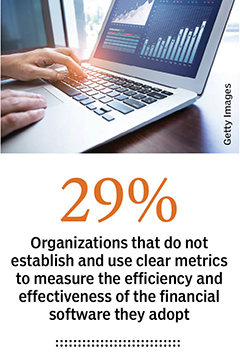 CFOs understand the importance of financial planning and analysis (FP&A) solutions that allow their finance teams to develop budgets and forecasts quickly and accurately. They need confidence in their numbers and the decisions they drive. But selecting the right FP&A software is only half the battle. Equally important is how that technology is implemented across the enterprise, from training users and setting their expectations to ensuring that they receive continued support after the software goes live. Absent a successful implementation, a company will never realize the full value from its investment. 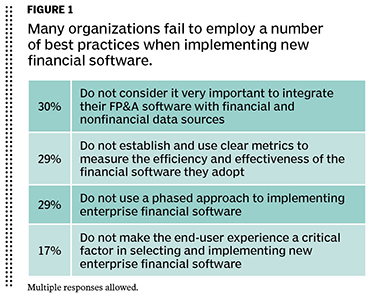 A new survey by CFO Research, in collaboration with Vena Solutions, provider of enterprise-class software for budgeting, planning, and forecasting, found that many companies employ a number of best practices when implementing new financial software. At the same time, a significant minority do not — including, in some cases, practices that affect far more than the success of the software implementation. Not following some of these practices can even impact a company’s ability to compete in a world where technology laggards operate at an increasingly wide disadvantage to more advanced peers. • Do not consider it very important to integrate their FP&A software not only with financial but also nonfinancial data sources, foregoing the opportunity to uncover more fully what’s driving their financial results. The challenges of conducting financial planning and analysis using legacy systems and processes are well known. 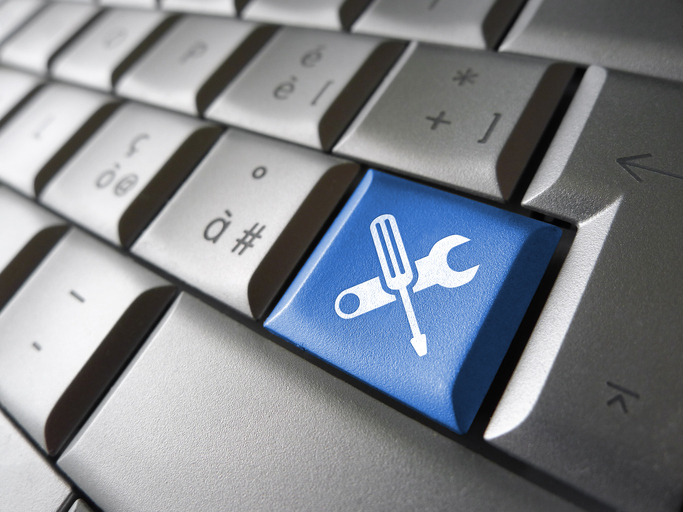 Legacy systems typically require that finance personnel manually copy and paste information from disconnected data sources into numerous, disparate spreadsheets. Those spreadsheets are then shared via email with other parties involved in their creation. Several revisions of those spreadsheets occur along the way and also get shared. While still common practice, that approach to FP&A is highly inefficient and lends itself to human error and version control problems. In some cases, requiring such tedious work can make it difficult to attract and retain skilled finance professionals. A critical path to addressing these problems is implementing an FP&A software solution that can use data from many different sources, both financial and nonfinancial, and unify them in a single database so that everyone is always working with the same set of information. Today’s best-in-class FP&A systems do that by automating routine processes, eliminating version control issues, providing robust reporting and analysis tools, and allowing finance professionals to spend more time on higher-value activities, like scenario modeling. The following set of implementation best practices are supported by the findings. Set and Manage User Expectations. Identifying goals, requirements, and success criteria upfront is critical to a successful implementation. By failing to spell this out early, CFOs risk burdening their organizations with wrong or poorly informed design decisions, gaps in functionality and usability, and longer adoption timelines and payback periods. They also may find they’ve damaged their own reputations and those of their organizations. In the survey, 81% of the executives polled said their organizations take the time to set clear expectations, timelines, and success criteria with their vendors, leaving nearly one in five that do not. Engage End Users Early and Often. All users of new software must know what’s in it for them and how their job will become easier once the new software has been implemented. They should understand how the new software and the process changes that accompany it will benefit the entire organization. Employees almost always perform better and adapt more easily to change when they feel they’re working toward a common and worthy goal. In addition, the more structured this process, the better the chances for success. 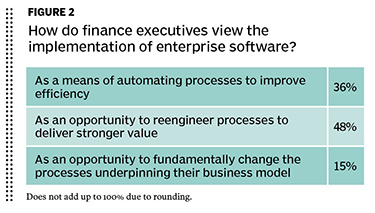 Seventy-five percent of survey respondents said their rollouts of new enterprise financial software were highly structured, and included demos, workshops, help lines, and peer-to-peer mentoring. Ensure Executive Leaders See Value. To ensure C-suite support, make sure the new system delivers reports that meet executives’ expectations. Senior finance managers need to understand the full value of the new software, including how it will help them play a more effective leadership role by providing faster, more accurate budgets, forecasts, and reports and drive company decisions with the right, forward-looking data. Focus on Quick Wins. Nothing drives support for a new software system, or its accompanying process changes, like demonstrable success, and the sooner it comes the better. The best way to deliver quick wins is to break the implementation into manageable phases, starting with a discrete process, like a departmental forecast. In addition to phasing in the implementation, finance can build faster support for the project by ensuring continued, controlled engagement with both end users and the software vendor. That can be facilitated by periodic peer reviews, design workshops, and team demonstrations. Identify Opportunities for Innovation. CFOs should look at implementations as a chance to improve on existing finance processes for which meaningful gains can be achieved, including: maintaining current processes but with greater efficiency, adoption, and reliability; retooling processes to improve how and when people and other resources are involved; and completely changing or adding processes to optimize efficiency and the overall value provided. Establish Clear Vendor and Customer Roles. Create a governance structure that keeps stakeholders aware of what’s happening, and both involved in and accountable for the process. Participants should include an executive sponsor for each side, and they should meet regularly. An internal project champion should promote the implementation’s progress using well-formatted and compelling internal updates. Even small wins should be celebrated. Ensure Integration with Systems. 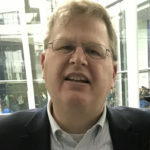 Today’s best FP&A solutions connect with ERP and other information systems containing operational and company-wide data. Once these ties are made, CFOs and their C-suite colleagues can use the software to more easily connect the dots between operating decisions and financial results, and more accurately forecast how results might play out under different scenarios. Ongoing Support. Companies will want to agree with their vendor, upfront, on support and maintenance expectations, including how long the vendor will take to respond to and resolve any issues. Companies also should look for a packaged service offering for the application areas they want to automate. In searching for the right offering, organizations should be mindful that the majority of FP&A implementations involve the same tasks, milestones, processes, training, and documentation — i.e., the same basic implementation stages. That allows for straightforward and consistent comparisons of the implementation timelines and pricing structures proposed by competing software providers.